We start at Austin 360 Bridge along capital of Texas Highway. Our start times are even hours every day except Saturday odd hours. 360 Bridge Boat Launch may charge a fee to enter but we will be there to pay that for you. Enter boat from docks at Boat Launch. Wear shoes that are comfortable to pedal in. We visit the lighthouse on Lake Austin, look at the bridge, and enjoy Bull Creek natural scenery. We also stop at County Line BBQ. The boat of transport is a Cycleboat. 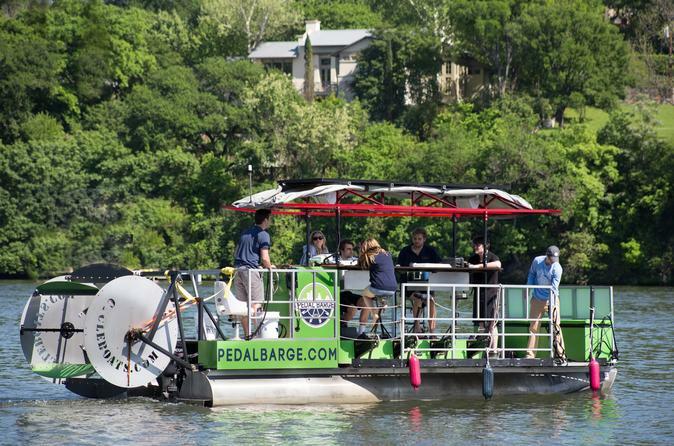 A pontoon boat with 8 pedal stations, a paddle wheel in the back, and a motor. You will have a captain and first mate to help you onboard and drive the boat for you.